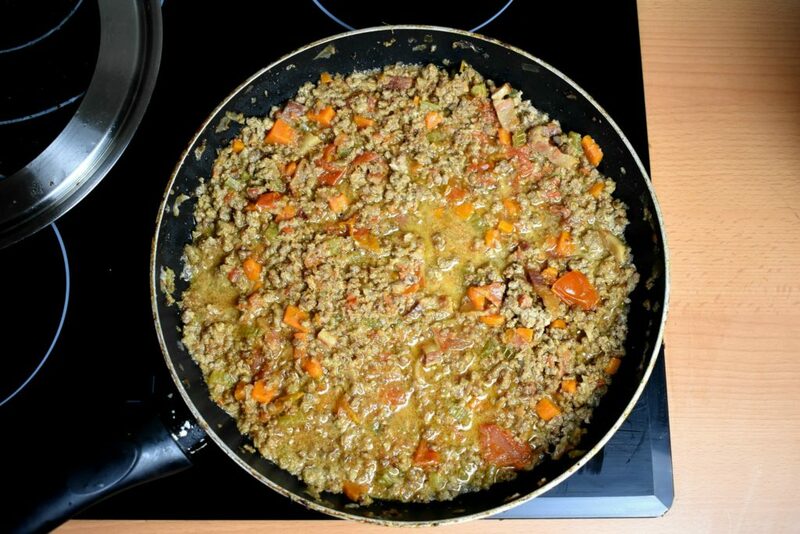 Few dishes are so abused as the Bolognese sauce is, by the Western culture and the emigrating Italians. Well, maybe the Pasta Carbonara is another one which oftentimes has no resemblance to the original dish in taste, ingredients or anything, except that it’s made of pasta. We have been brought up believing that the life around us is true to its word and deception is the tool of the devil. Only to face the rue reality that we take granted, doesn’t even exist outside of our small circle of knowledge. Who to blame for that is not as important as to be open to the new and ready to learn the truth when time comes and accept that life isn’t perfect, neither are we. Who would have thought that minced meat mixed with ketchup on spaghetti is not Pasta Bolognese or in fact, pouring ketchup on pizza is not how real pizza sauce is made. Well, there are greater wicked deeds in the world than this but hopefully these people at least go to the purgatory to be cleansed of their sins. 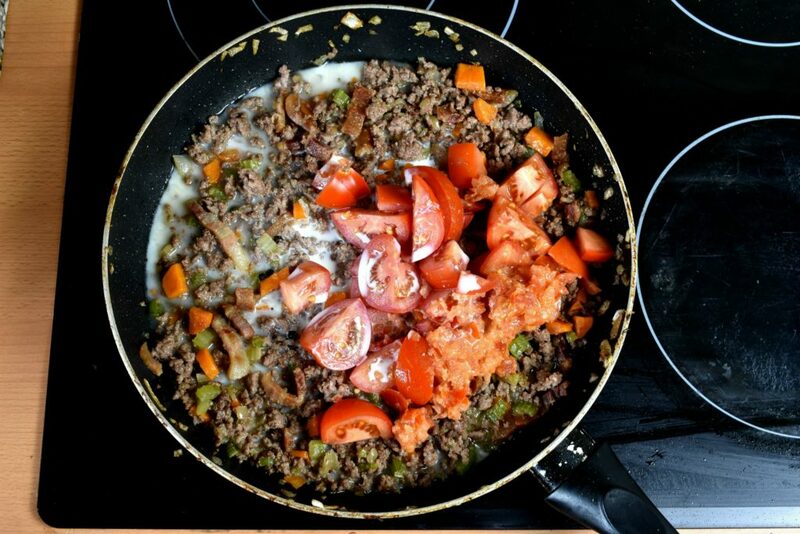 Most likely people who prepare their own food, once in a while from scratch realize that ketchup is not really an ingredient in cooking but a condiment, and it is supposed to be used sparingly and not as the main part of the dish so they use plain chopped tomatoes or tomato sauce when preparing something hot Italian food for their beloved family. Italian cuisine is famous for its usage of oregano, basil and tomato in their dishes. It’s like an unspoken rule decided by higher beings or it’s like true companionship. Where one goes the other two follows. It’s the same in the Spaghetti Bolognese. Only there isn’t really a thing like Spaghetti Bolognese. Or at least not in Italy where Bologna is. The tomato mixed up with minced meat and served on top of spaghetti is virtually unheard of these parts of Italy and it’s a complete mystery lost in the mists of time why people call this dish Spaghetti Bolognese. 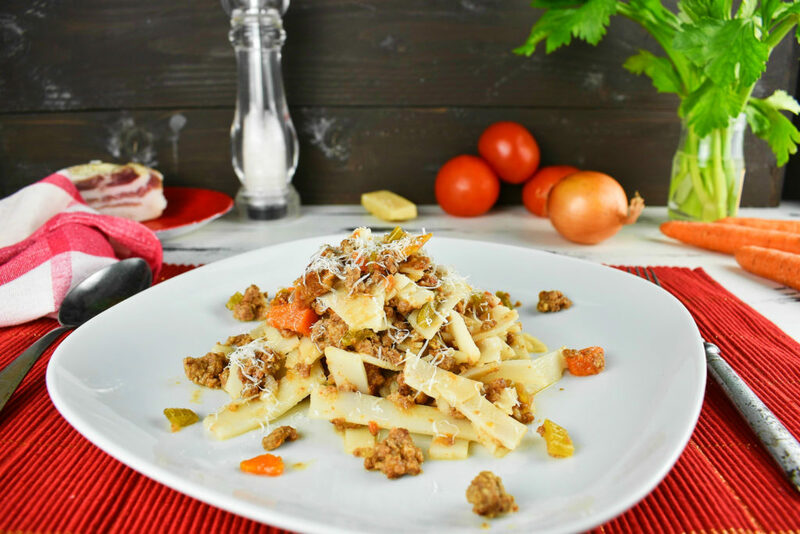 Bolognese sauce there simply called “ragu” and authentically made out of 4 hours cooked minced beef mixed together with tagliatelle type of pasta. The most shocking part is that it doesn’t contain any oregano or basil. The fact is, it doesn’t need that much tomato and it is basically cooked with milk, should come as a small surprise after that. Sure, enough these recipes aren’t written in stone so everybody makes their own version, adding more or less ingredients into their own dishes, as it is always the case with cooking. 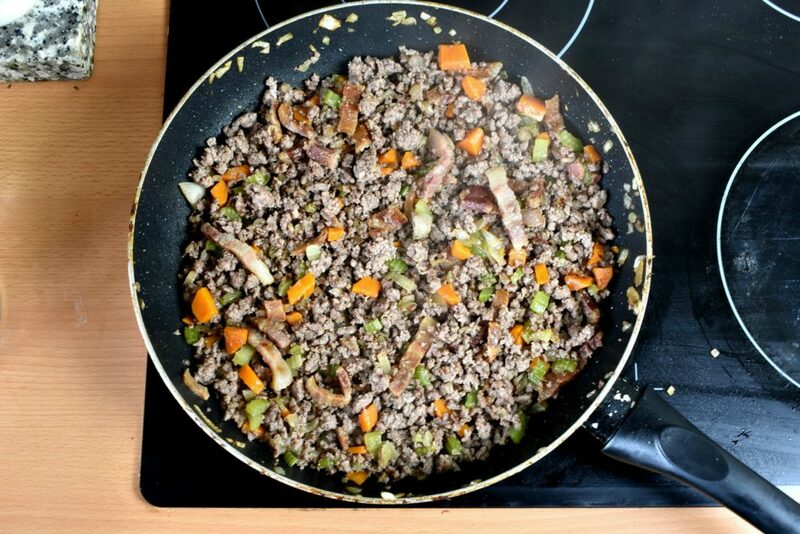 It can be made out of any kind of meat, it doesn’t matter if it’s minced or just finely chopped up. Same goes with the herbs and spices we favor at the times of cooking. If oregano and basil is what we want on our plate then that is what we have to put into our dish. It’s worth to note that Italians knew that there will be some rogue cook who won’t be happy with their recipe and some may go berserk with it ruining their heritage like whipped cream the Pasta Carbonara so the Italian Academy of Cuisine registered the “authentic” ragu alla Bolognese with the Bologna Chamber of Commerce in 1982. 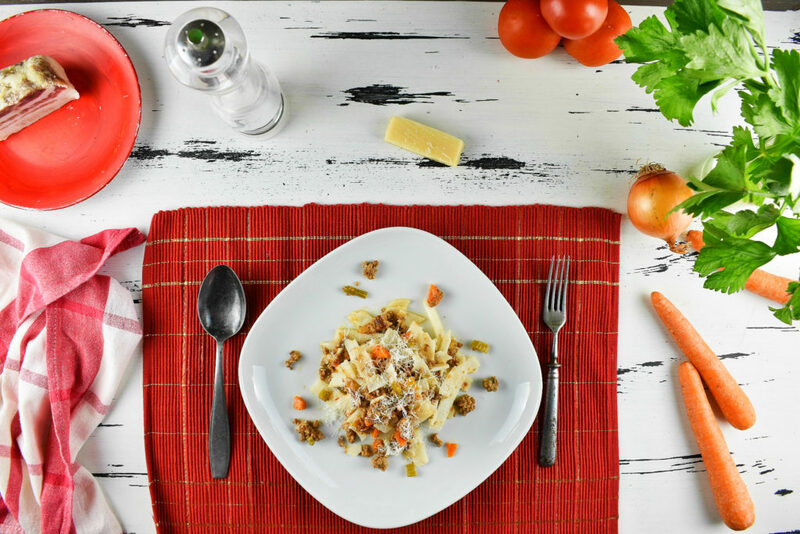 This recipe will follow the footsteps of the original Bolognese Sauce with the small change in the pasta type as we will use gluten free rice tagliatelle for that. We also used milk and skipped the white wine which are both optional and can be substituted with plain water without any serious harm. Cooking for 4 hours may seem excessive but for some reason beef tastes better when cooked longer. Although, after 1.5 hours it’s totally edible and presentable if there is time then spend that time on it. It’s totally worth it. 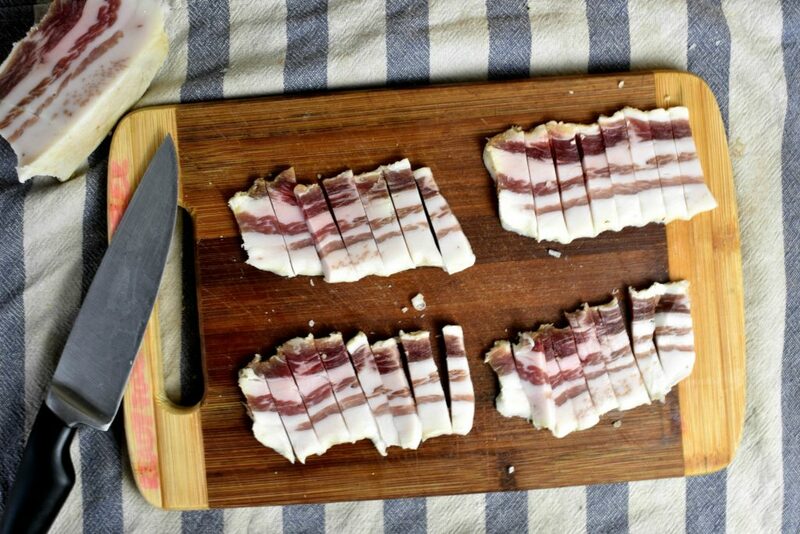 Cut the Bacon or pancetta or any other type of pork that we can use as lardon. We can substitute it with a tablespoon of fat or cooking oil, as well. No harm would be done. 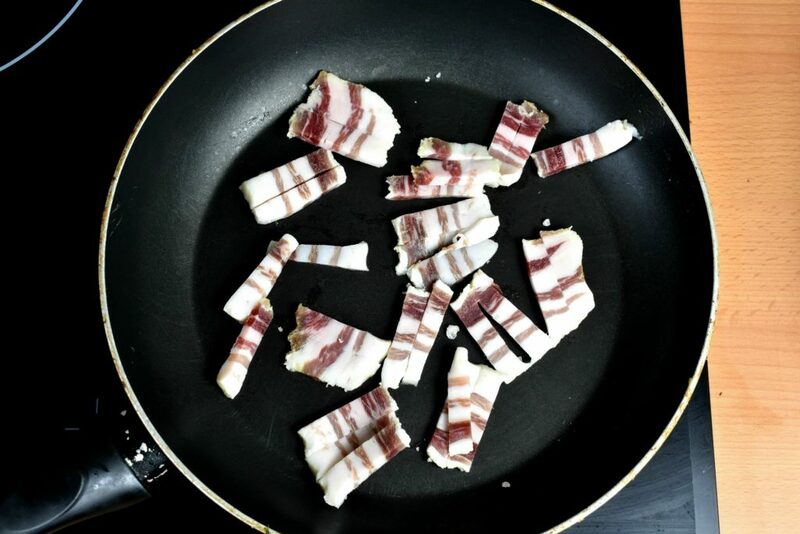 Place them into a frying pan and preferably on low to medium heat melt the fat. It requires some stirring and flipping until it reaches a golden brown color. The whole process is done in about 5 to 10 minutes. 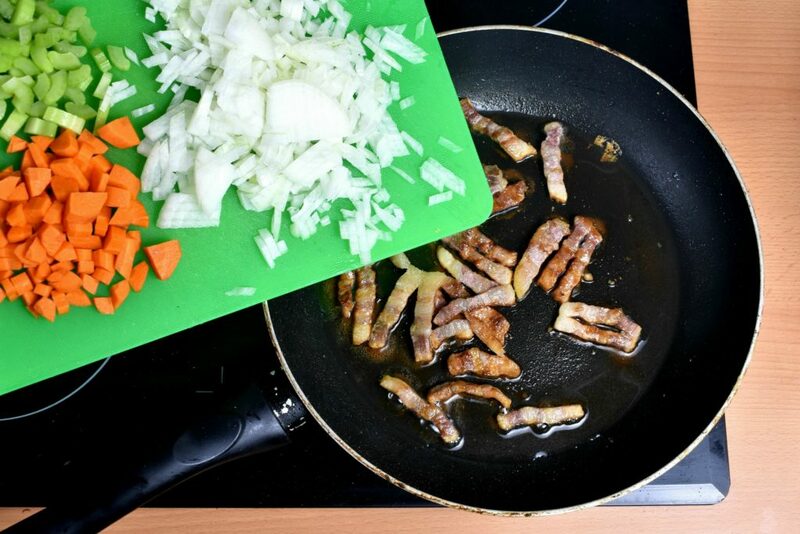 Meanwhile the bacon is in the frying pan, dice up the onion, carrot and celery then add it into the pan. Saute the vegetables with the bacon on medium heat for about 5 minutes until the onion gets a slight translucent/glassy look. This takes around 5 minutes. 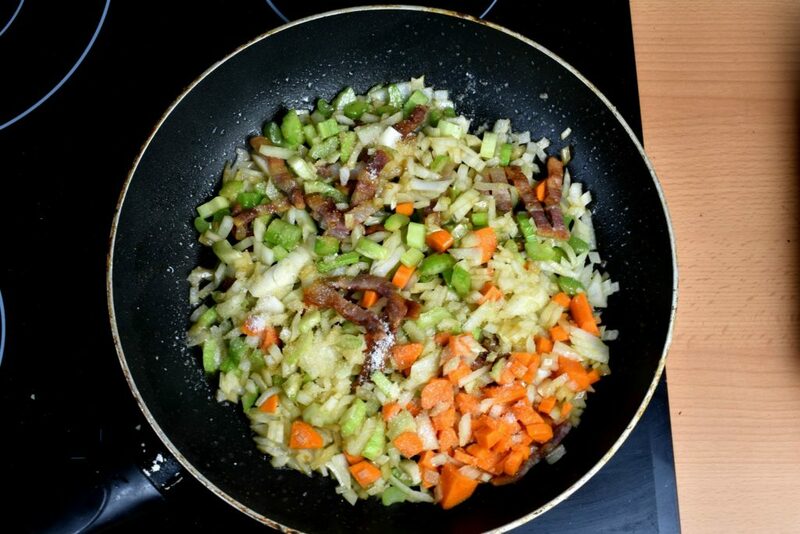 Add the beef and mix it well with the vegetables. 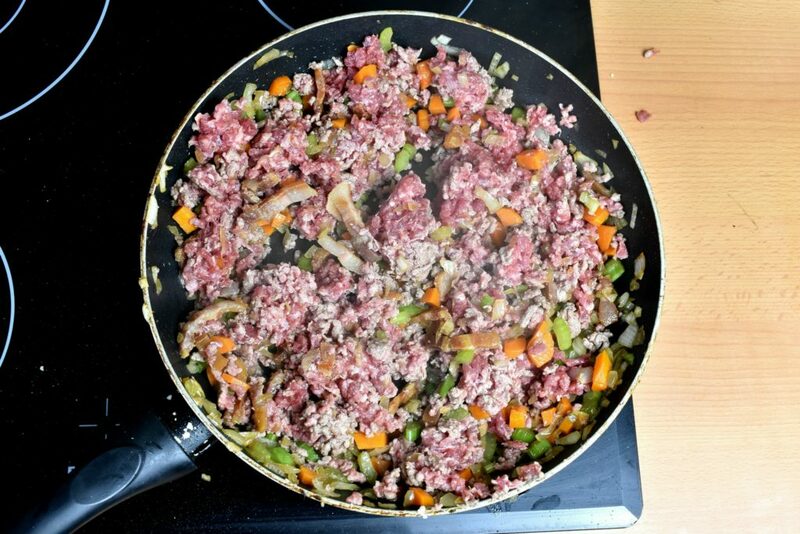 Increase heat to medium-high and cook the beef for 10-15 minutes while stirring it often until all the bigger chunks are falling into smaller pieces. At this point the beef should lose all its pinkness and it’s browned properly. 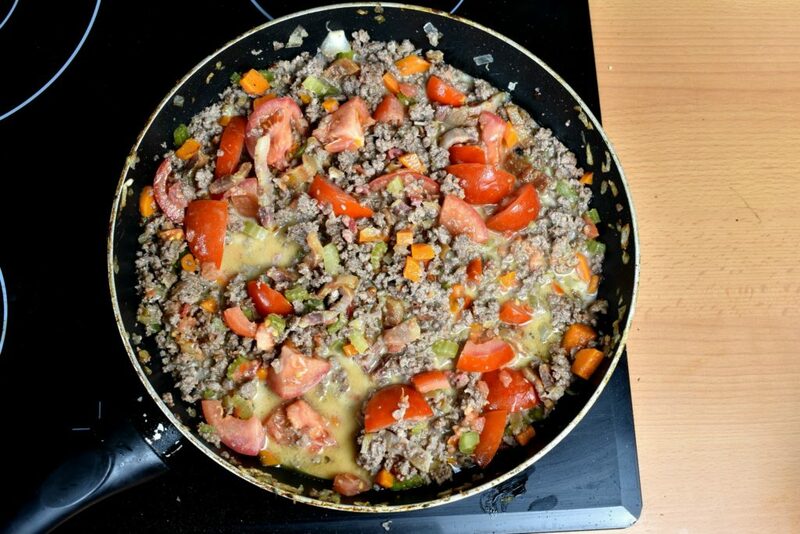 Add the water or wine, diced or mashed tomatoes, salt, black pepper and milk. 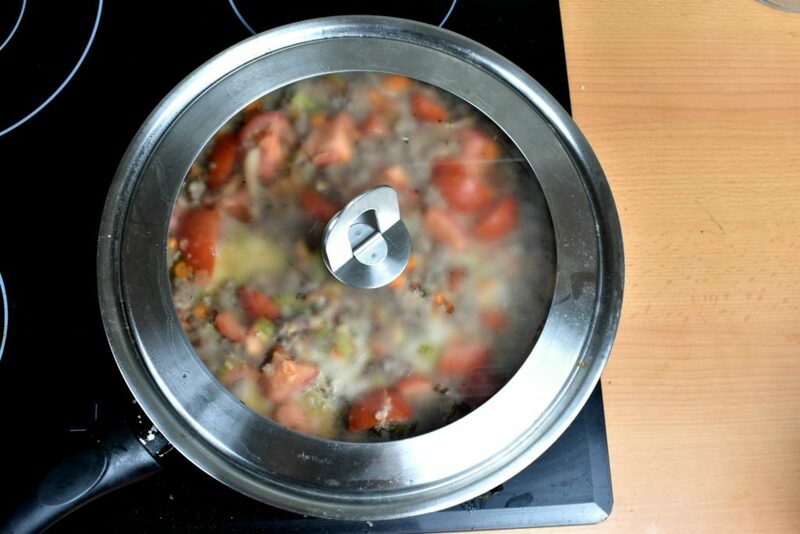 Mix it well together, put the lid on and simmer it for 4 hours on low heat, stirring occasionally. After 1,5 hours it’s edible, presentable and tasty but its true nature will only show itself after 4 hours of slow simmering. 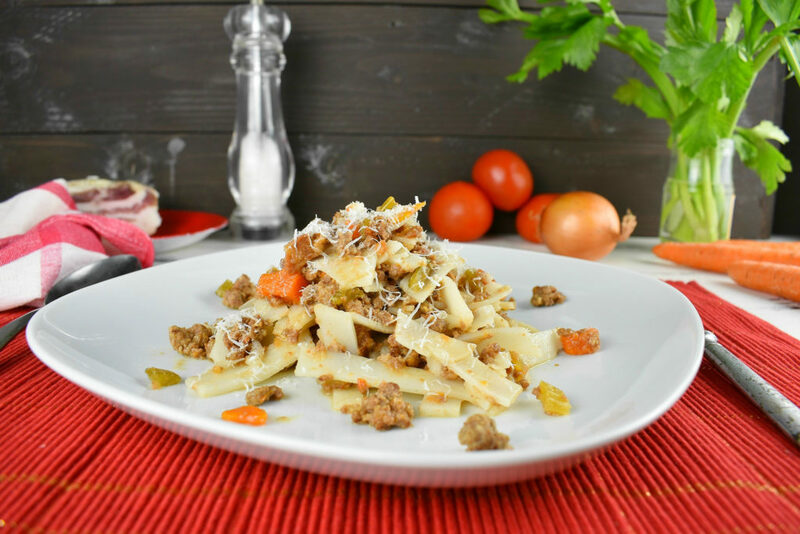 It is generally served already mixed up with the Taglietelle pasta but optionally it can be served separately or with alternative types, like in this case homemade gluten free rice pasta. Which is a real suffering to make, so if there is a chance to buy it, don’t hesitate to pick up a pack or two instead of making them at home. Increase heat to medium-high and cook the beef for 10-15 minutes while stirring it often until all the bigger chunks are falling into smaller pieces. At this point the beef should lose all its pinkness and it's browned properly. After 1,5 hours it's edible, presentable and tasty but its true nature will only show itself after 4 hours of slow simmering.